Today’s crowns, the visible part of a tooth replacement system, can effectively mimic the shape and color of natural teeth. But not all crowns are equal — so it’s best to be well-informed before you undergo a restoration on your natural teeth such as a single crown or bridgework — or if you need a crown on a dental implant that replaces a missing tooth. To give you a starting point, here are 3 things to keep in mind about crowns as you consider a dental restoration. Material composition. Most crowns in years past were made of a precious metal, most notably gold. What it lacked in appearance, it made up for in performance and durability. In recent years, dental porcelain has become the popular choice because of its ability to mimic the appearance and translucent color of natural teeth. Today’s porcelains are much stronger and are used more frequently for back teeth than in years past. A common recommendation for back teeth is a hybrid crown using metal and porcelain. Metal is incorporated beneath the porcelain in this type of crown to create a strong foundation and is also used along biting surfaces for strength. 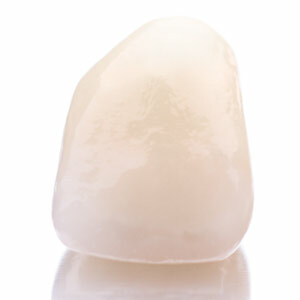 Porcelain is used in the more visible areas for esthetics. The dental technician’s level of artistry. Most dentists sub-contract crown fabrication to dental laboratory technicians who may have varying levels of experience and artistic ability. A highly skilled technician can produce a crown that blends seamlessly with the patient’s remaining natural teeth. Take a “test drive” of your future smile. Although we as dentists adhere to certain aesthetic principles, beauty is ultimately subjective — “in the eye of the beholder.” The final product must meet your expectations and level of comfort. If available, then, consider wearing temporary “trial smile” crowns as a preview of your new smile while your permanent set is under construction. This allows you to “try out” your future smile ahead of time, so you can make recommendations and sign off on the final set before it’s finished. Undertaking any dental restoration is an important life step, both for your health and appearance. Being well-informed — especially about the crowns that you and others will see — will help you make wise choices that lead to a satisfying outcome. If you would like more information on crowns, please contact us or schedule an appointment for a consultation.